Land area: 462,840 sq. km. ; about the size of California. Cities: Capital: Port Moresby (307, 643). Other cities — Lae (190,178), Mt. Hagen (39,003). Terrain: Mostly mountains with coastal lowlands and rolling foothills. The largest portion of the population lives in fertile highlands valleys that were unknown to the outside world until the 1930s, but that supported agriculture some 10,000 years ago, possibly before agriculture was developed elsewhere. Annual population growth rate (2010): 2.0%. Languages: Three official languages are English, Tok Pisin, and Motu. There are approximately 860 other languages. Education: Years compulsory: 0. Literacy Rate — 49.3%. Health: Infant mortality rate (2009): 52/1,000. Life expectancy (2009) — 62.0 yrs. Branches: Executive: Queen Elizabeth II (head of state, represented by a governor general); prime minister (head of government). Legislative — unicameral parliament. Judicial — independent; highest is Supreme Court. Administrative subdivisions: 19 provinces and the national capital district (Port Moresby). Major political parties: National Alliance (NA), People's Progress Party (PPP), United Resources Party (URP), PNG Party (PNGP). Nominal GDP (2010): U.S. $8.80 billion; PGK 21.84 billion. Average exchange rate (2009): U.S. $1 = PGK 2.7. Real GDP growth rate (2010): 47.1%. Per capita GDP (2009): U.S. $1,180. Natural resources: Gold, copper ore, crude oil, natural gas, timber, fish, oil palm, tea, rubber, logs. Forestry (4% of GDP); marine (1% of GDP); minerals and oil (82% of GDP). Agriculture (32% of GDP): Major products — coffee, cocoa, coconuts, palm oil, timber, tea, vanilla. Industry (35% of GDP): Major sectors: copra crushing; palm oil processing; plywood production; wood chip production; mining of gold, silver, and copper; construction; tourism; crude oil production, refined petroleum production. Trade: Exports: 67% of GDP: gold, copper ore, oil, timber, palm oil, coffee. Major markets (in order by value — high to low) — Australia, Japan, Philippines, Germany, South Korea, , United Kingdom, , and Malaysia. Imports — 40% of GDP: machinery and transport equipment, vehicles, manufactured goods, food, mineral fuels, chemicals. Major suppliers (in order by value — high to low) — Australia, China, Singapore, United States, Japan, New Zealand, Malaysia, Hong Kong, Indonesia, and United Kingdom. The indigenous population of Papua New Guinea is one of the most heterogeneous in the world. Papua New Guinea has several thousand separate communities, most with only a few hundred people. Divided by language, customs, and tradition, some of these communities have engaged in low-scale tribal conflict with their neighbors for millennia. The advent of modern weapons and modern migration into urban areas has greatly magnified the impact of this lawlessness. The isolation created by the mountainous terrain is so great that some groups, until recently, were unaware of the existence of neighboring groups only a few kilometers away. The diversity, reflected in a folk saying, "For each village, a different culture," is perhaps best shown in the local languages. Spoken mainly on the island of New Guinea — composed of Papua New Guinea and the Indonesian province of West Papua — some 800 of these languages have been identified; of these, only 350-450 are related. The remainder seem to be totally unrelated either to each other or to the other major groupings. Most native languages are spoken by a few hundred to a few thousand, although Enga, used in part of the highlands, is spoken by some 130,000 people. However, the Enga people are subdivided into clans that regularly conflict with each other. Many native languages are extremely complex grammatically. Melanesian Pidgin serves as the lingua franca. English is spoken by educated people and in Milne Bay Province. The overall population density is low, although pockets of overpopulation exist. Papua New Guinea's Western Province averages one person per square kilometer (3 per sq. mi.). The Chimbu Province in the New Guinea highlands averages 20 persons per square kilometer (60 per sq. mi.) and has areas containing up to 200 people farming a square kilometer of land. The highlands are home to 40% of the population. A considerable urban drift toward Port Moresby and other major centers has occurred in recent years. The trend toward urbanization accelerated in the 1990s, bringing in its wake squatter settlements, ethnic disputes, unemployment, public utilities pressure, and attendant social problems, especially violent crime. Approximately 96% of the population is Christian. The churches with the largest number of members are the Roman Catholic Church, the Evangelical Lutheran Church, the United Church, and the Seventh Day Adventist church. 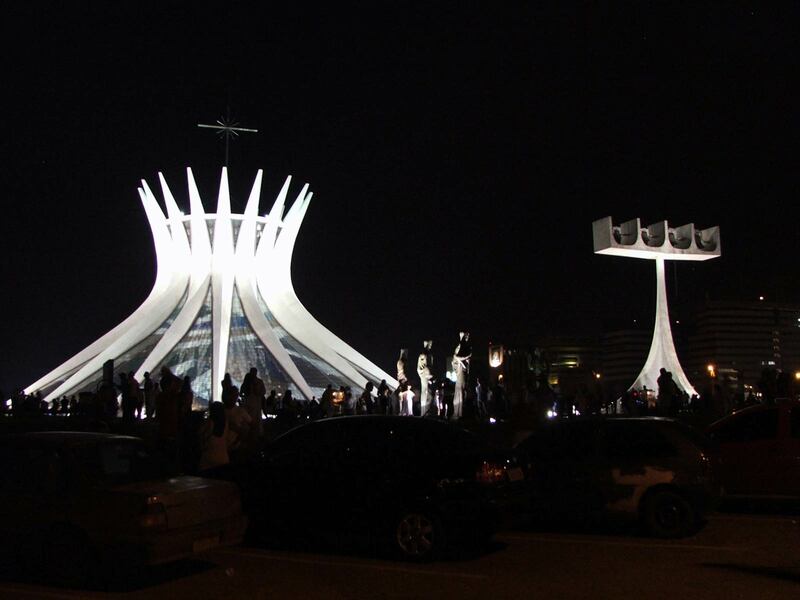 Although the major churches are under indigenous leadership, a large number of missionaries remain in the country. The bulk of the estimated 2,000 Americans resident in Papua New Guinea are missionaries and their families. The non-Christian portion of the indigenous population, as well as a portion of the nominal Christians, practices a wide variety of religions that are an integral part of traditional culture, mainly animism (spirit worship) and ancestor cults. Foreign residents comprise about 1% of the population. More than half are Australian; others are from China, the United Kingdom, New Zealand, the Philippines, India, and the United States, most of whom are missionaries. Since independence, about 900 foreigners have become naturalized citizens. Though cultures vary widely, traditional Papua New Guinea social structures generally include the following characteristics:The practice of subsistence economy;Recognition of bonds of kinship with obligations extending beyond the immediate family group;Generally egalitarian relationships with an emphasis on acquired, rather than inherited, status; andA strong attachment of the people to land, which is held communally. Traditional communities do not recognize a permanent transfer of ownership when land is sold.Though land and other possessions may be inherited through the female line in some cultures, women generally are considered and treated as inferiors. Gender violence is endemic.Patterns and frequency of sexual activity, though never publicly discussed (especially in rural areas), contribute to the current rapid spread of HIV. Archeological evidence indicates that humans arrived on New Guinea at least 60,000 years ago, probably by sea from Southeast Asia during an Ice Age period when the sea was lower and distances between islands shorter. Although the first arrivals were hunters and gatherers, early evidence shows that people managed the forest environment to provide food. There also are indications of gardening having been practiced at the same time that agriculture was developing in Mesopotamia and Egypt. Early garden crops — many of which are indigenous — included sugarcane, Pacific bananas, yams, and taros, while sago and pandanus were two commonly exploited native forest crops. Today's staples — sweet potatoes and pigs — were later arrivals, but shellfish and fish have long been mainstays of coastal dwellers' diets. When Europeans first arrived, inhabitants of New Guinea and nearby islands — while still relying on bone, wood, and stone tools — had a productive agricultural system. They traded along the coast, where products mainly were pottery, shell ornaments, and foodstuffs, and in the interior, where forest products were exchanged for shells and other sea products. The first Europeans to sight New Guinea were probably the Portuguese and Spanish navigators sailing in the South Pacific in the early part of the 16th century. In 1526-27, Don Jorge de Meneses accidentally came upon the principal island and is credited with naming it "Papua," a Malay word for the frizzled quality of Melanesian hair. The term "New Guinea" was applied to the island in 1545 by a Spaniard, Inigo Ortiz de Retes, because of a fancied resemblance between the islands' inhabitants and those found on the African Guinea coast. Although European navigators visited the islands and explored their coastlines for the next 170 years, little was known of the inhabitants until the late 19th century. With Europe's growing need for coconut oil, Godeffroy's of Hamburg, the largest trading firm in the Pacific, began trading for copra in the New Guinea Islands. In 1884, Germany formally took possession of the northeast quarter of the island and put its administration in the hands of a chartered company. In 1899, the German imperial government assumed direct control of the territory, thereafter known as German New Guinea. In 1914, Australian troops occupied German New Guinea, and it remained under Australian military control until 1921. The British Government, on behalf of the Commonwealth of Australia, assumed a mandate from the League of Nations for governing the Territory of New Guinea in 1920. That mandate was administered by the Australian Government until the Japanese invasion in December 1941 brought about its suspension. Following the surrender of the Japanese in 1945, civil administration of Papua as well as New Guinea was restored, and under the Papua New Guinea Provisional Administration Act, 1945-46, Papua and New Guinea were combined in an administrative union. On November 6, 1884, a British protectorate was proclaimed over the southern coast of New Guinea (the area called Papua) and its adjacent islands. The protectorate, called British New Guinea, was annexed outright on September 4, 1888. The possession was placed under the authority of the Commonwealth of Australia in 1902. Following the passage of the Papua Act of 1905, British New Guinea became the Territory of Papua, and formal Australian administration began in 1906. Papua was administered under the Papua Act until the Japanese invaded the northern parts of the islands in 1941 and began to advance on Port Moresby and civil administration was suspended. 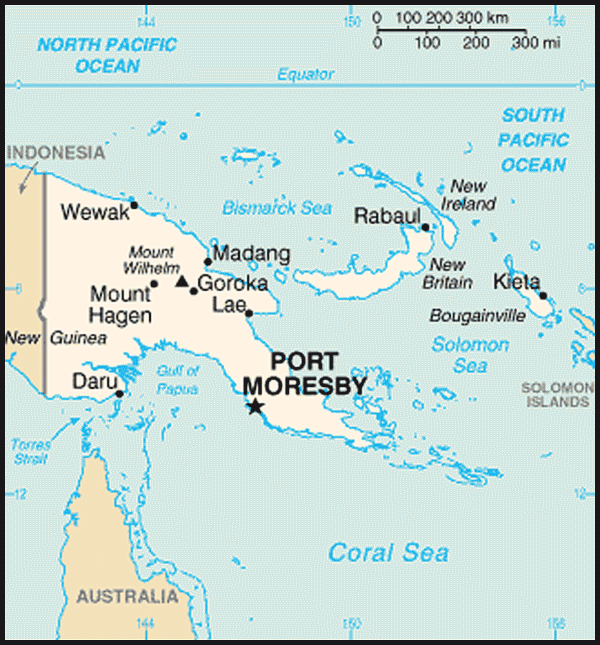 During the war, Papua was governed by a military administration from Port Moresby, where Gen. Douglas MacArthur occasionally made his headquarters. As noted, it was later joined in an administrative union with New Guinea during 1945-46 following the surrender of Japan. The Papua and New Guinea Act of 1949 formally approved the placing of New Guinea under the international trusteeship system and confirmed the administrative union of New Guinea and Papua under the title of "The Territory of Papua and New Guinea." The act provided for a Legislative Council (established in 1951), a judicial organization, a public service, and a system of local government. A House of Assembly replaced the Legislative Council in 1963, and the first House of Assembly opened on June 8, 1964. In 1972, the name of the territory was changed to Papua New Guinea. Elections in 1972 resulted in the formation of a ministry headed by Chief Minister Michael Somare, who pledged to lead the country to self-government and then to independence. Papua New Guinea became self-governing in December 1973 and achieved independence on September 16, 1975. The 1977 national elections confirmed Michael Somare as Prime Minister at the head of a coalition led by the Pangu Party. However, his government lost a vote of no confidence in 1980 and was replaced by a new cabinet headed by Julius Chan as Prime Minister. The 1982 elections increased Pangu's plurality, and parliament again chose Somare as Prime Minister. In November 1985, the Somare government lost a vote of no confidence, and the parliamentary majority elected Paias Wingti, at the head of a five-party coalition, as Prime Minister. A coalition, headed by Wingti, was victorious in very close elections in July 1987. In July 1988 a no-confidence vote toppled Wingti and brought to power Rabbie Namaliu, who a few weeks earlier had replaced Somare as leader of the Pangu Party. In 1992 Paias Wingti was elected Prime Minister. Julius Chan took his place in 1994 after a vote of no confidence. The 1997 elections brought Bill Skate to power as Prime Minister, but he was replaced by Mekere Morauta after a vote of no confidence in 1999. Michael Somare returned as Prime Minister after the 2002 general elections. He led his national alliance party into the 2007 elections and remained as the Prime Minister, becoming the longest-serving parliamentarian in the Commonwealth. Somare celebrated his 40th year in politics on March 16, 2008. Such reversals of fortune and a revolving-door succession of prime ministers have characterized Papua New Guinea's national politics. From 1988 to 2002, the country had numerous prime ministers. A plethora of political parties, coalition governments, shifting party loyalties, and motions of no confidence in the leadership all lent an air of instability to political proceedings. For the first 27 years of independence, a "first past the post" electoral system resulted in many parliamentarians elected with less than 15% of their constituency. Fractious politics and a 75% loss rate for incumbents precluded the development of strong political parties or a stable national leadership. The limited preferential voting, introduced in 2003, and an organic law on political parties strengthened political stability. In the 2007 elections, 66 members of parliament lost their seats. The government was formed by a coalition of several parties, and Michael Somare, the leader of the National Alliance (and the nation's first Prime Minister in 1975), was elected Prime Minister. His government was the first to complete a 5-year term since independence and hopes to complete a 10-year term. The next national elections will be held in 2012. Papua New Guinea, a constitutional parliamentary democracy, recognizes Queen Elizabeth II as head of state. She is represented by a governor general who is elected by parliament and who performs mainly ceremonial functions. Papua New Guinea has three levels of government — national, provincial, and local. There is a 109-member unicameral parliament, whose members are elected every 5 years. The parliament in turn elects the prime minister, who appoints his cabinet from members of his party or coalition. Papua New Guinea's judiciary is independent of the government. It protects constitutional rights and interprets the laws. There are several levels, culminating in the Supreme Court. Papua New Guinea's politics are highly competitive with most members elected on a personal and ethnic basis within their constituencies rather than as a result of party affiliation. Members of parliament are now elected in a limited preferential voting (LPV) system. There are several parties, but party allegiances are not strong. Winning independent candidates are usually courted in efforts to forge the majority needed to form a government, and allegiances are fluid. No single party has yet won enough seats to form a government in its own right. Papua New Guinea has a history of changes in government coalitions and leadership from within parliament during the 5-year intervals between national elections. New governments are protected by law from votes of no confidence for the first 18 months of their incumbency, and no votes of no confidence may be moved in the 12 months preceding a national election. In an effort to create greater stability by reducing incessant votes of no confidence, the Organic Law on the Integrity of Political Parties and Candidates (OLIPPAC) was passed in 2001, forbidding members of each party in parliament from shifting loyalty to another party. In July 2010, the Supreme Court ruled certain provisions of the OLIPPAC unconstitutional including those requiring members of parliament (MPs) to vote along party lines on matters such as the budget and motions of no confidence, and restricting MPs from resigning and joining other political parties. Soon after the Supreme Court ruling, three government ministers, including Deputy Prime Minister Puka Temu, resigned from the government and joined the opposition in a bid to move a vote of no confidence against Prime Minister Michael Somare. The bid was unsuccessful because the Speaker of Parliament did not allow a vote to be taken on the motion before adjourning parliament until November. In 2003, the electoral system was changed to limited preferential voting, which has begun to encourage politicians to strike alliances and to be responsive to constituent concerns once elected. The new system was used in the 2007 national general elections. However, 53 election petitions disputing returns were registered with the courts. Allegations included bribery, intimidation, block voting, and undue influence. On Bougainville Island, a 10-year rebellion was halted by a truce in 1997 and a permanent cease-fire was signed in April 1998. A peace agreement between the Government and ex-combatants was signed in August 2001. Under the eyes of a regional peace-monitoring force and a UN observer mission, the government and provincial leaders established an interim administration and made significant progress toward complete surrender/destruction of weapons. A constitution was drafted in 2004 and provincial government elections were held in May 2005. The elections were deemed to be free and fair by international observers, and Joseph Kabui was elected to serve as the first president of the Autonomous Bougainville Government (ABG). Bougainvilleans also participated in Papua New Guinea national elections in 2007 to elect representatives to the national parliament. Kabui died of a heart attack in June 2008. James Tanis was elected President of the ABG in December 2008. Presidential and parliamentary elections were held in May 2010, and John Momis was elected President. A referendum was tentatively agreed to be held between 2015 and 2020, 10 to 15 years following formation of the ABG. Progress has been slow with the ABG initially focusing on disarmament, peace, and reconciliation. A small percentage of former fighters have created illegal "no go zones," particularly in the Central and South Bougainville. Papua New Guinea maintains an embassy (http://www.pngembassy.org/) at 1779 Massachusetts Ave. NW, Washington, DC 20036 (tel. 202-745-3680; fax 202-745-3679). The Papua New Guinea mission to the United Nations is at 801 Second Avenue, New York, NY 10017 (tel. 212-682-6447). Papua New Guinea is rich in natural resources, including minerals, oil, gas, timber, and fish, and produces a variety of commercial agricultural products. The economy generally can be separated into subsistence and market sectors, although the distinction is blurred by smallholder cash cropping of coffee, cocoa, and copra. Approximately 75% of the country's population relies primarily on the subsistence economy. The minerals, timber, and fish sectors are dominated by foreign investors. Manufacturing continued to be slow in 2010. The service industry was stable, while tourism shows potential and remains largely untapped. Generally, economic activity has continued to grow since2007. The growth was boosted by favorable international commodity prices. Employment grew modestly. The financial sector enjoyed high liquidity, with increased lending due to low interest rates. Inflation remained low. Papua New Guinea is richly endowed with gold, copper, oil, natural gas, and other minerals. In 2006 minerals and oil export receipts accounted for 82% of GDP. Government revenues and foreign exchange earnings depend heavily on mineral and oil exports. Indigenous landowners in areas affected by minerals projects also receive royalties from those operations. Copper and gold mines are currently in production at Porgera, Ok Tedi, Misima, and Lihir. A consortium led by Exxon/Mobil signed a final investment decision in December 2009 to begin the commercialization of the country's estimated 22.5 trillion cubic feet of natural gas reserves through the construction of a liquefied natural gas (LNG) production facility. Interoil, an American-owned firm, opened Papua New Guinea's first oil refinery in 2004 and is also building a second liquefied natural gas production facility which it aims to complete by 2012 with production capacity of 32,500 barrels of product per day. Papua New Guinea also produces and exports valuable agricultural, timber, and marine products. Agriculture currently accounts for 32% of GDP and supports more than 75% of the population. Cash crops ranked by value are coffee, oil, cocoa, copra, tea, rubber, and sugar. About 40% of the country is covered with exploitable trees, but a domestic woodworking industry has been slow to develop. A number of Southeast Asian companies are active in the timber industry, but World Bank and other donors have withdrawn support from the sector over concern for unregulated deforestation and environmental damage. Recently enacted forestry legislation has exacerbated those concerns. Papua New Guinea has an active tuna industry, but much of the catch is made by boats of other nations fishing in Papua New Guinea waters under license. Papua New Guinea is a signatory to the South Pacific Tuna Treaty (SPTT), under which U.S. purse seiners fish for tuna in the exclusive economic zones (EEZs) of the Pacific Island parties. Locally produced fish exports are confined primarily to shrimp. In general, the Papua New Guinea economy is highly dependent on imports for manufactured goods. Its industrial sector — exclusive of mining — accounts for only 9% of GDP and contributes little to exports. Small-scale industries produce beer, soap, concrete products, clothing, paper products, matches, ice cream, canned meat, fruit juices, furniture, plywood, and paint. The small domestic market, relatively high wages, and high transport costs are constraints to industrial development. Australia, Singapore, and Japan are the principal exporters to Papua New Guinea. Petroleum and mining machinery and aircraft have been the strongest U.S. exports to Papua New Guinea. Australia is Papua New Guinea's most important export market, followed by Japan and the European Union. The U.S. imports modest amounts of gold, copper ore, cocoa, coffee, and other agricultural products from Papua New Guinea. Most of those exports take place through third countries. With the 2003 withdrawal of Chevron/Texaco, Australian companies are the most active in developing Papua New Guinea's mining and petroleum sectors. Exxon/Mobil retains a major share of natural gas reserves and is constructing a liquefied natural gas processing facility. Interoil, backed by an Overseas Private Investment Corporation (OPIC) loan, operates an oil refinery in Port Moresby and in September 2010 signed an agreement with Energy World Corporation (EWC) to complete front-end engineering and design and a final investment decision to establish the second LNG project in the country. China is increasing its investment in Papua New Guinea, including development of the $1 billion Ramu nickel mine. 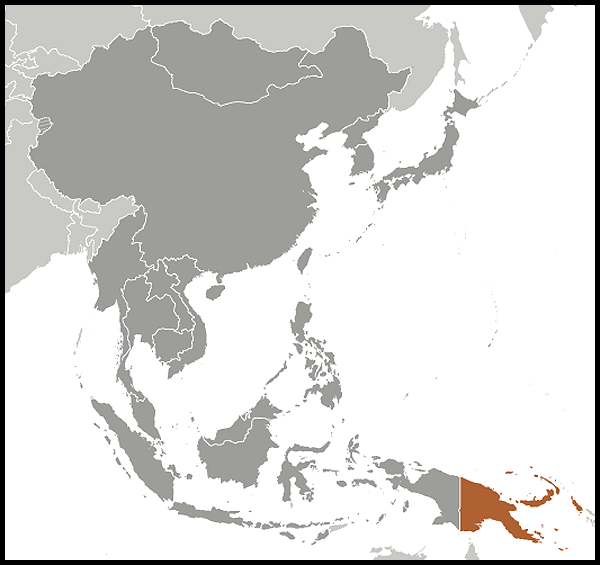 Papua New Guinea became a participating economy in the Asia-Pacific Economic Cooperation (APEC) Forum in 1993. It joined the World Trade Organization (WTO) in 1996. It is an observer at ASEAN and a member of the ASEAN Regional Forum. It has preferential tariff agreements with the markets of Melanesian and Pacific Island neighbors through the Melanesian Spearhead Group (MSG) Trade Agreement and the Pacific Islands Countries Trade Agreement (PICTA). Australia is by far the largest bilateral aid donor to Papua New Guinea, offering about $355 million a year in assistance. Budgetary support, which has been provided in decreasing amounts since independence, was phased out in 2000, with aid concentrated on project development. In 2004, Australia and Papua New Guinea embarked on the Enhanced Cooperation Program (ECP), under which Australia agreed to provide direct assistance, including 210 line police officers, to the Papua New Guinea constabulary. The ECP met with initial success, but was abruptly ended when Papua New Guinea's Supreme Court stripped Australian police officers of immunity in May 2005. Virtually all ECP personnel left Papua New Guinea following the court's decision. The governments of Papua New Guinea and Australia are now involved in protracted negotiations on a scaled-down version of the ECP. Other major sources of aid to Papua New Guinea are Japan, the European Union, the People's Republic of China, Taiwan, the United Nations, the Asian Development Bank, the International Monetary Fund, and the World Bank. Volunteers from a number of countries and mission church workers also provide education, health, and development assistance throughout the country. Foreign assistance to Papua New Guinea is approximately $46 per capita. The U.S. funds a $1.5 million-per-year HIV/AIDS project in Papua New Guinea. After years of decline and government deficit, Papua New Guinea was bolstered in recent years by a general rise in commodity prices and by government steps toward spending control.Economic activity accelerated in 2010 resulting in an estimated economic growth of 7.1% compared to a 5.5% in 2009. This was largely due to the start of construction on the US$15 billion liquefied natural gas project led by ExxonMobil as well as a recovery in international commodity prices. . However, the economic improvements are based almost entirely on high commodity prices and the nation continues to have serious problems of corruption, a lack of law and order, land tenure concerns stifling investment, political interference in business, and a lack of political will to adopt needed sweeping reforms. Papua New Guinea's foreign policy reflects close ties with Australia and other traditional allies. Papua New Guinea is by far the largest Pacific Island nation and has traditionally viewed itself as part of the Pacific. However, in recent years it has also been cultivating relations with Asian nations. Its views on international political and economic issues are generally moderate. Papua New Guinea has diplomatic relations with 56 countries. The United States and Papua New Guinea established diplomatic relations upon the latter's independence on September 16, 1975. The two nations belong to a variety of regional organizations, including the Asia-Pacific Economic Cooperation (APEC) forum; the ASEAN Regional Forum (ARF); the Secretariat of the Pacific Community (SPC); and the South Pacific Regional Environmental Program (SPREP). One of the most successful cooperative multilateral efforts linking the U.S. and Papua New Guinea is the U.S.-Pacific Islands Multilateral Tuna Fisheries Treaty, under which the U.S. grants $18 million per year to Pacific Island parties and the latter provide access for U.S. fishing vessels. The United States has provided significant humanitarian assistance to Papua New Guinea and contributed to the rehabilitation of Bougainville. The U.S. Agency for International Development (USAID) funds a $1.5 million-per-year HIV/AIDS project in Papua New Guinea and contributed $150,000 to Oro disaster relief efforts. The Pacific Partnership 2008 mission provided humanitarian assistance in Port Moresby and Oro Province. School and health clinic engineering projects were completed and over 25,000 people received medical care. The Pacific Partnership 2010 mission provided humanitarian assistance in Rabaul, East New Britain Province. Health and engineering programs were completed in conjunction with local non-governmental organizations. An ongoing International Military Education and Training (IMET) program and HIV/AIDS training program exists. The U.S. also supports Papua New Guinea's efforts to protect biodiversity. The U.S. Government supports the International Coral Reef Initiative aimed at protecting reefs in tropical nations such as Papua New Guinea. USAID contributes to the Coral Triangle Initiative (CTI) focused on preserving coral reefs, fisheries, and food security. Papua New Guinea is one of six CTI countries. U.S. military forces, through Pacific Command (PACOM) in Honolulu, Hawaii, provide training to the Papua New Guinea Defense Force (PNGDF) and have held small-scale joint training exercises. The U.S. provides police and other education and training courses to national security officials. The U.S. also annually sponsors a handful of Papua New Guinea officials and private citizens to meet and confer with their professional counterparts and to experience the U.S. firsthand through the International Visitor Leadership Program (IVLP) and workshops sponsored by the United States Patent and Trademark Office (USPTO) and the Asia Pacific Secretariat (APEC). The U.S. Peace Corps ceased operations in Papua New Guinea in 2001 due to security concerns. About 2,000 U.S. citizens live in Papua New Guinea, with major concentrations at the headquarters of New Tribes Mission and the Summer Institute of Linguistics (SIL), both located in the Eastern Highlands Province. Following the severe sea swells in December 2008, the United States provided $150,000 of humanitarian assistance. The U.S. Embassy (http://portmoresby.usembassy.gov/) in Papua New Guinea is located on Douglas Street, Port Moresby (tel. 675-321-1455; fax 675-321-3423). The mailing address is 4240 Port Moresby Pl., U.S. Department of State, Washington, DC 20521-4240.